When people think of sailing, their minds drift to the Greek islands, or the Dalmatian Coast of Croatia, but venture to the cusp of Asia and you’ll find one of the world’s most spectacular rivieras. 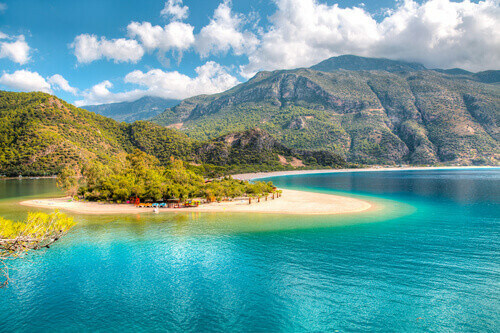 The aptly named Turquoise Coast runs along the country’s southwest, encompassing many magnificent seaside cities like Antalya and Fethiye. Despite boasting powder-white sand lapped by crystalline seas and a fascinating history, the region has remained relatively untouched by mass tourism, making it an ideal destination for curious visitors. 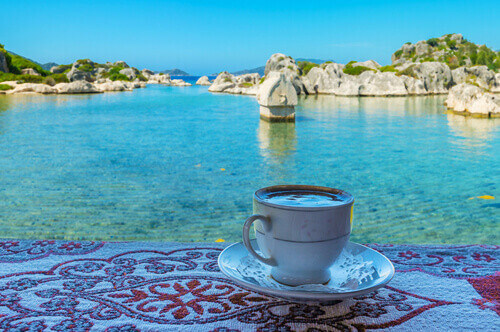 Lycia was a region along the Mediterranean coast of Turkey, and although records of its existence date back thousands of years, little is known about the Lycian people. The first mention of Lycia is within Egyptian, Hittite and Ugaritic records from the 13th and 14th century BC, where it’s noted as occupying the Teke Peninsula between western Caria and eastern Pamphylia. It’s believed that they helped to invade Egypt in the late 13th century and enjoyed relative autonomy under Persian and Roman rule for many years. They even had their own Antatolic language. 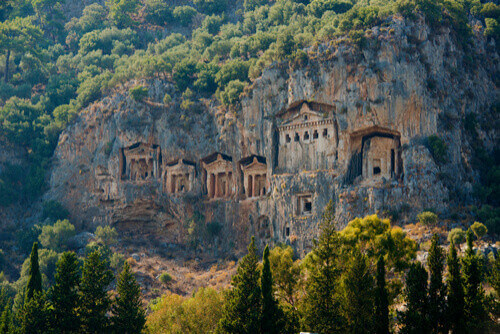 For history buffs, many ruins dating back to Lycian times are scattered around the region and are open to the public. 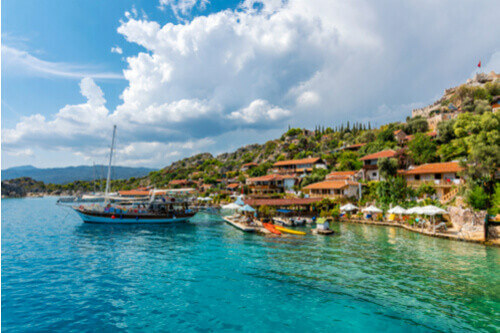 The best way to explore the sights of former Lycia is to hop aboard a traditional gulet and sail the Mediterranean coast. Far from an enormous cruise ship, gulet’s are hand-built wooden vessels, designed with a low profile and sharp bow to maximise their stability. Most are equipped with both a motor and sails and while they appear primitive from the outside, they’re exceedingly well-fitted. A typical gulet boat will has a sheltered deck area, beds or lounges to bask in the Turkish sun, a dining area and of course a bowsprit where you can recreate the famous ‘I’m flying’ scene from Titanic. Gulet boats are the perfect size for exploring the Turkish coast. They can dock at small piers in shallow water, navigate into narrow coves and drop anchor at will so passengers can swim. The boats simply drift in and out of coastal towns like a tide, dropping off visitors on shore for the day and whisking them away when the sun goes down. It also means that local villages benefit from tourism, without being overwhelmed by it. Each morning, claim your spot on the top deck and watch the sparkling southern coast float by. The town of Göcek – lush and flanked by mountains – is a highlight of the journey, as is Bedri Rahmi Bay. Along the way, your captain will make regular swimming stops amidst pockets of impossibly clear water, like Tersane Bay. Grab a snorkel and dive in - if you’re lucky, you might even spot a turtle or two! In the evening, watch the sunset with a cold drink in hand and learn about local history from your knowledgeable crew. In Turkey, you’ll never go hungry and your sailing adventure is no exception. Despite the tiny size of the kitchen, your crew will prepare tasty spreads for breakfast, lunch and dinner, as if by magic. Between meals you’ll be spoiled with Turkish coffee, tea and treats. 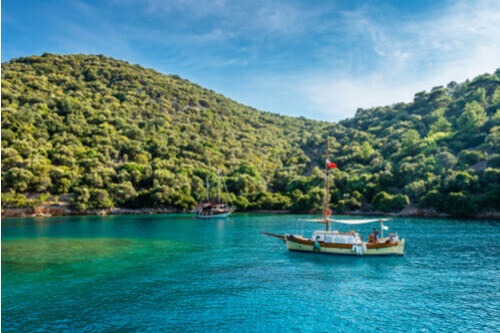 A sailing adventure along the Turquoise Coast is a true delight. It’s the perfect opportunity to reflect on your time in Turkey, away from the chaos of the mainland, yet it still provides an authentic, Anatolian experience.